Fully understanding the procedure and what to expect during your initial consultation for a hair transplantation procedure will help give you the best results possible. Board certified expert hair restoration, facial plastic and cosmetic surgeon, Dr. Jason Champagne, will examine everything from your medical history to your daily activities in order to prepare you for the procedure. Dr. Champagne will address your goals and will discuss your treatment options to give you realistic expectations to the final appearance of your hair transplantation. During your initial consultation, he will also examine if you're a good candidate for the procedure as well as recommending actions you can take to prepare for the procedure. Depending on your age and general health, certain preoperative tests may be necessary. What’s the downtime for Hair Transplantation? The downtime is typically extremely minimal (on average 1-2 days) without any bruising or swelling. For example, patients from out of town usually fly home within 24-48 hours. When will I see results / my hair grow in? With hair transplantation alone, patients typically start to see hair growth 3-4 months after their procedure, but Dr. Champagne customizes treatment plans with the latest techniques like PRP (platelet rich plasma), laser technology and oral medication to significantly improve and speed up your growth process. Through techniques known as Follicular Unit Transfer (FUT) and/or Follicular Unit Extraction (FUE), Dr. Champagne moves individual hair follicles from an area of greater density on the back of the scalp to areas that have thinned over time. In doing so, he is able to achieve a look that gives your hair improved thickness while appearing completely natural. He specializes in creating patterns for hair grafts that follow the natural flow of hair for each individual to achieve optimal results. If you are looking to correct thin, patchy or absent facial hair, Dr. Champagne also performs hair transplantation to the eyebrows, mustache and beard area. 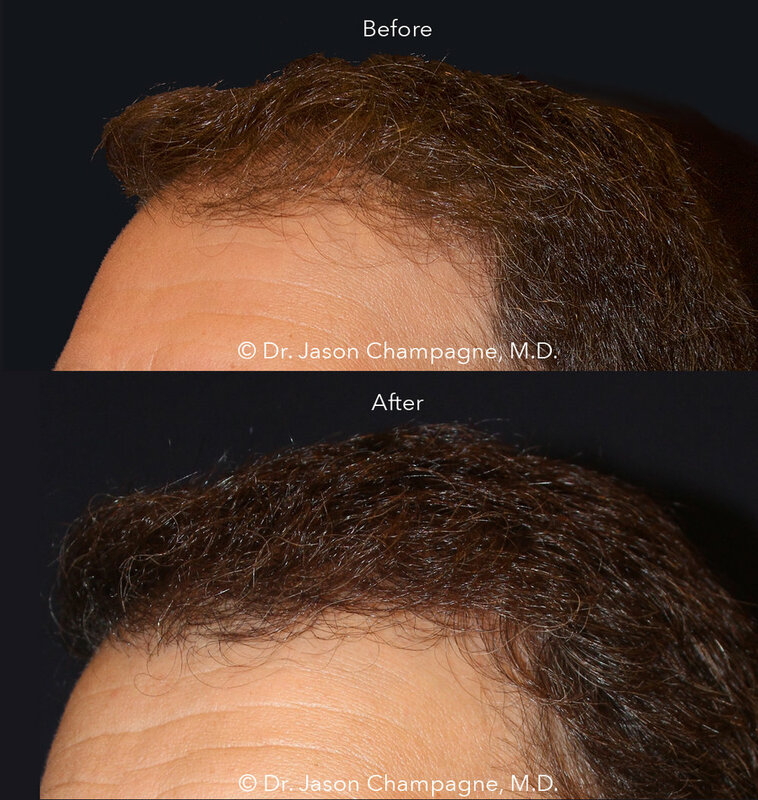 Please contact our office to schedule a personalized, confidential consultation with our expert hair restoration surgeon, Dr. Jason Champagne. During your consultation, Dr. Champagne will address your goals and answer any questions you may have regarding hair transplantation or any other procedure we offer.